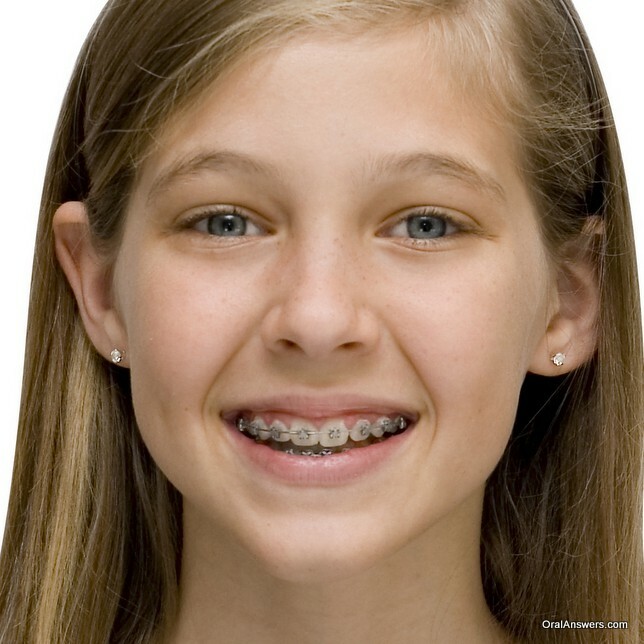 Home Tags Posts tagged with "Braces"
Many teenagers wonder what they’ll look like with braces, and what colors of rubber bands will look best with their hair color and facial tone. 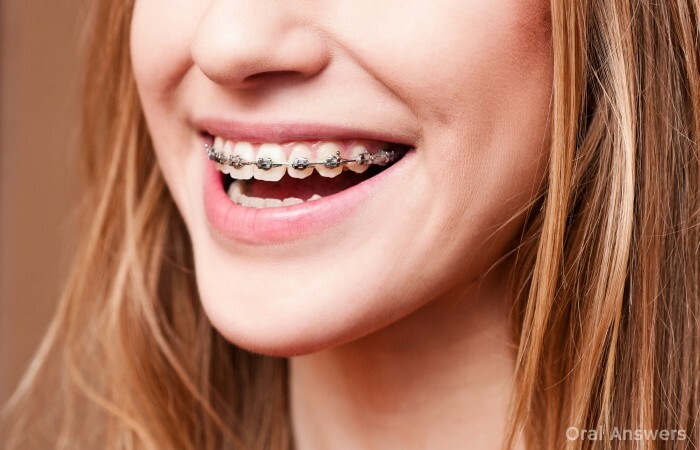 Judging by the comments on this article about braces colors, I decided it would be a good idea to create a post with dozens of pictures of teenagers with braces so you can get a general idea of how you’ll look with braces. 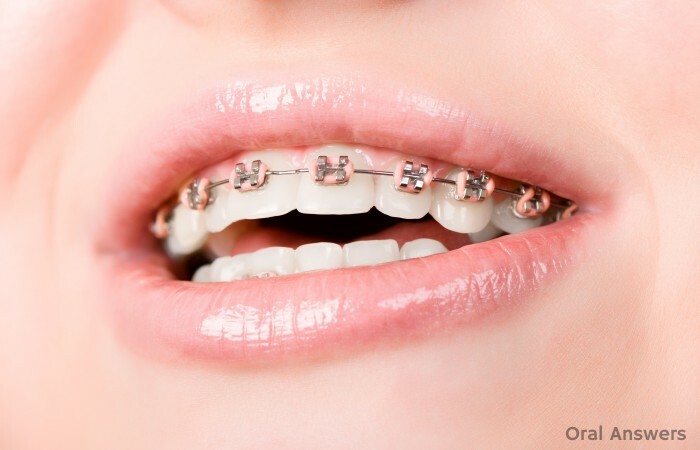 As you take a look at the pictures below, you may notice that some people look confident with braces, and some people don’t. 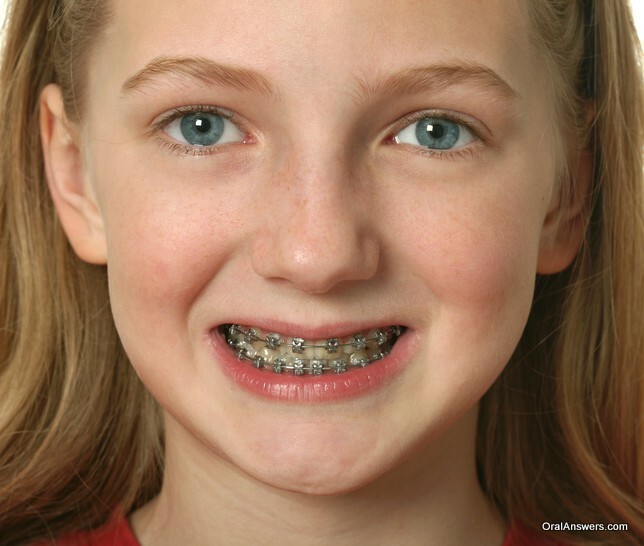 If you try to smile and look proud of your braces, people will see you as more confident, and you’ll likely enjoy having braces more. It all comes down to attitude. Hopefully there’s someone here that looks similar to you! This blond young woman appears confident as she smiles, showing off a pink powerchain on her upper braces. 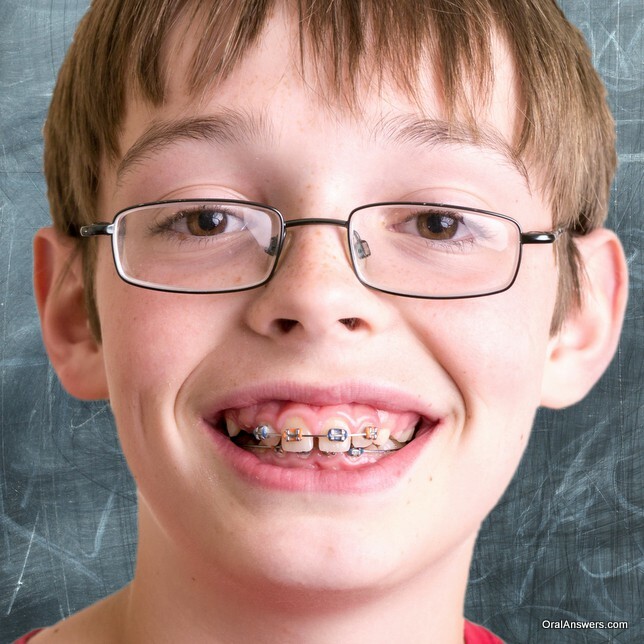 This young man appears confident even though he wears glasses and his braces pop right out at you. Even with the braces and glasses, he proudly shows off blue and orange colored bands around his braces. 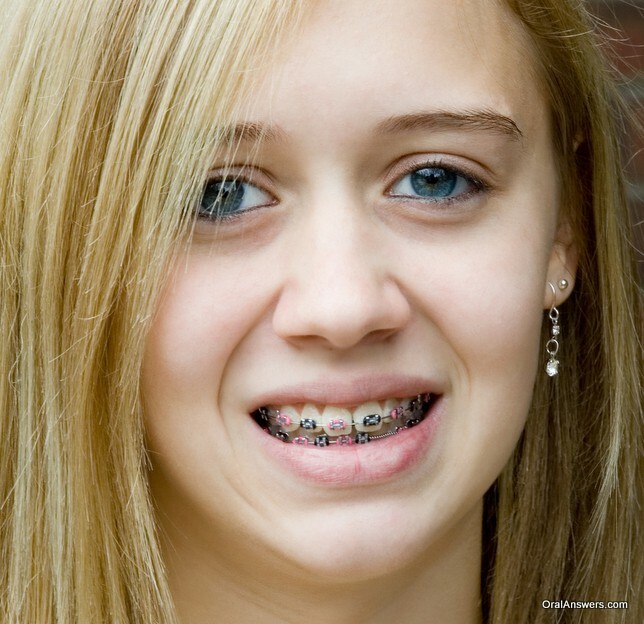 This blond-haired, blue-eyed young woman smiles, showing off gray and green colored bands around her braces. This blond-haired, blue-eyed young woman sports silver-colored elastic bands around her braces. 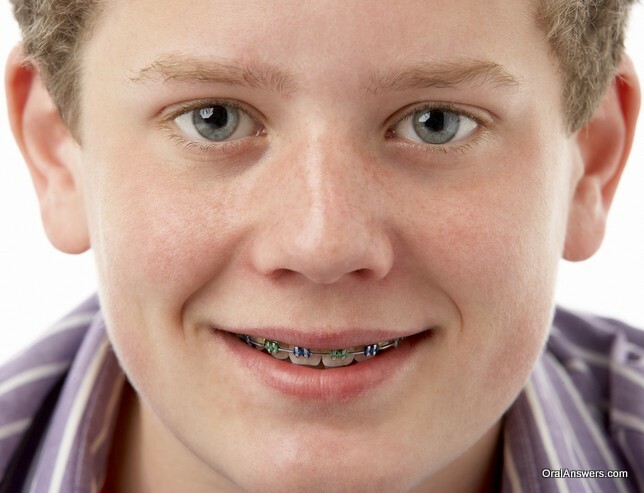 This brown-haired, blue-eyed young man is sporting blue and green colored elastics on his braces. 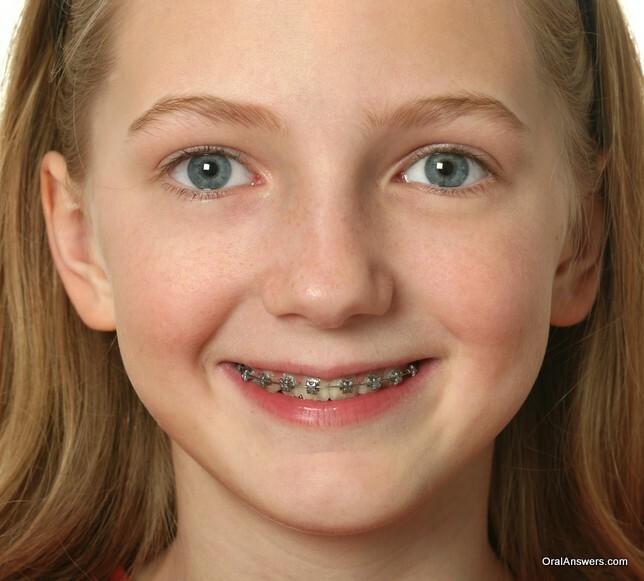 This young woman is proudly smiling, showing her blue elastics on her upper braces. 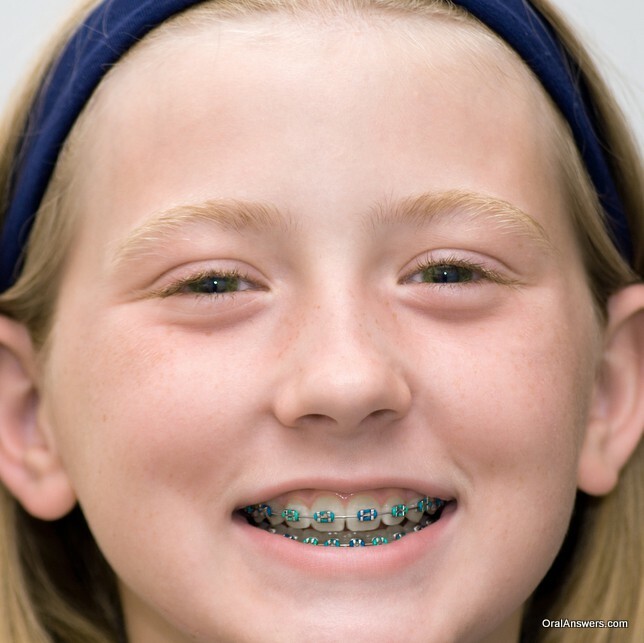 This young woman is rocking a few different shades of blue elastics on her braces: light green, teal, and blue. 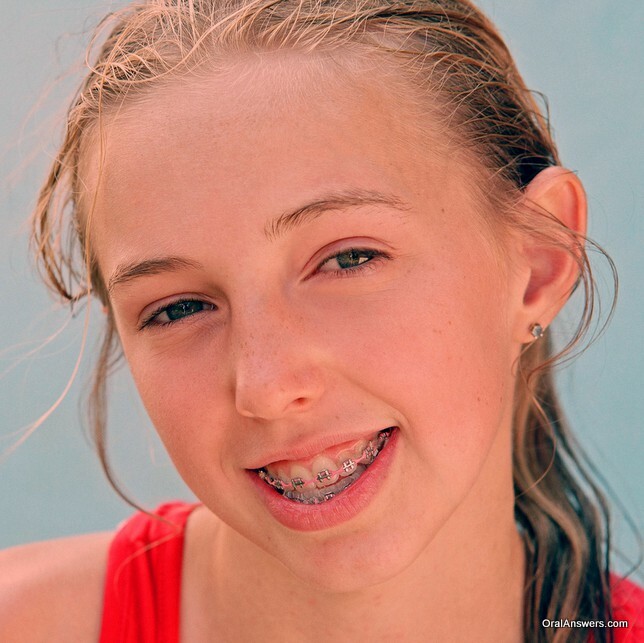 This blond-haired, blue-eyed young woman is smiling, displaying her upper and lower braces with black and pink-colored elastics. 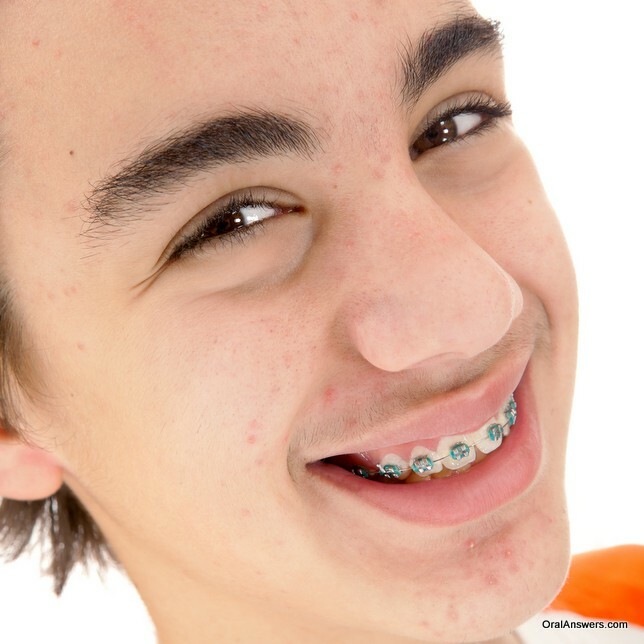 This young man is smiling enough that we can see his red elastic bands on his upper braces. 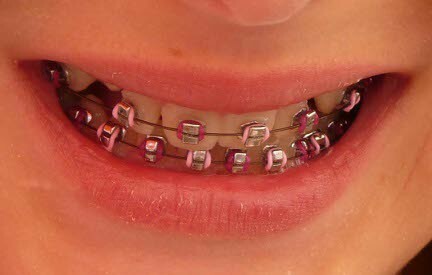 This young woman is smiling big enough to show off her upper and lower braces with pink elastics. This young woman probably needs to work on her smiling skills! 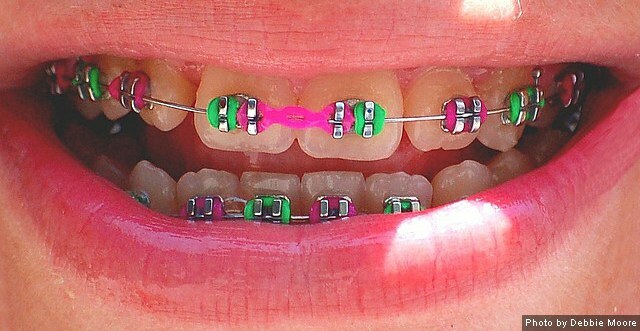 She’s displaying pink and green colored elastics alternating on the top teeth with green bands on the lower four front teeth with pink bands next to them. 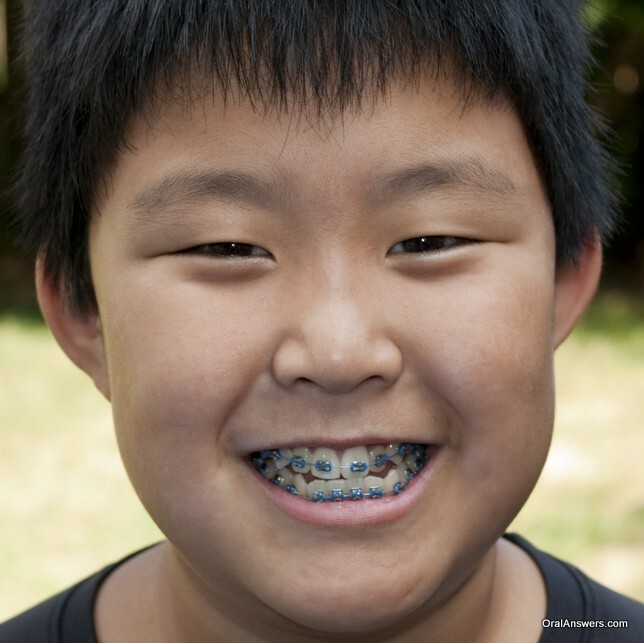 This young man smiles, showing off blue-colored elastic bands on his braces. This young woman looks pretty happy with the world, showing off pink and green colored elastics. 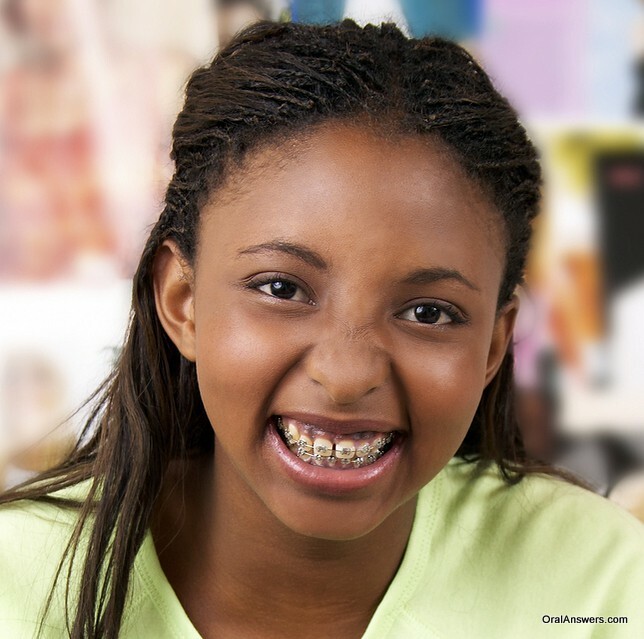 This young woman smiles revealing a silver powerchain that links the braces on her upper teeth. This young man isn’t afraid to prove to the world that pink isn’t just for girls. 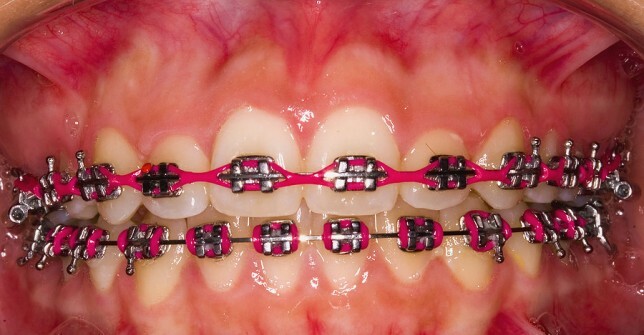 This young woman is seen sporting a popular choice for braces colors: pink and green. This young woman also thinks highly of the colors green and pink. This young man has chosen blue and green for his elastics. 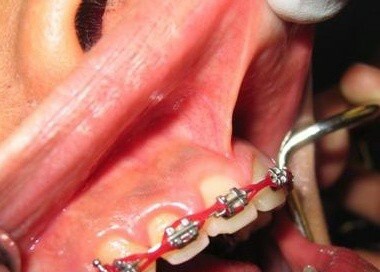 This young lady has chosen silver elastic bands that match the silver color of her braces. 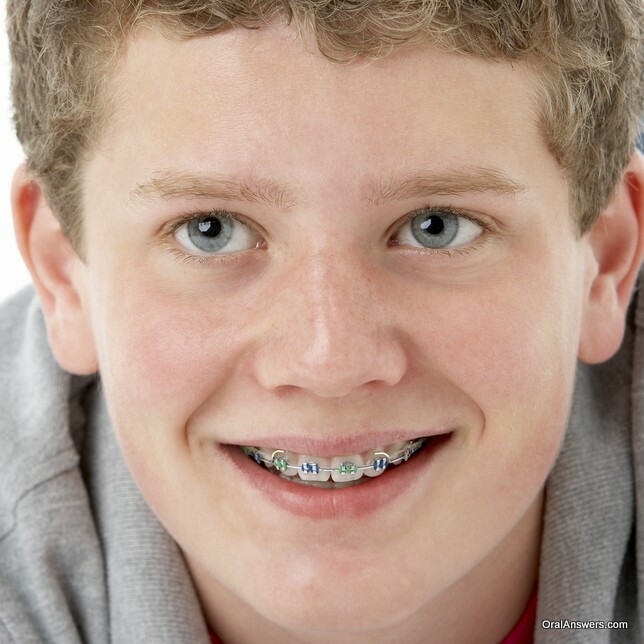 This young man displays a blue powerchain on his braces. 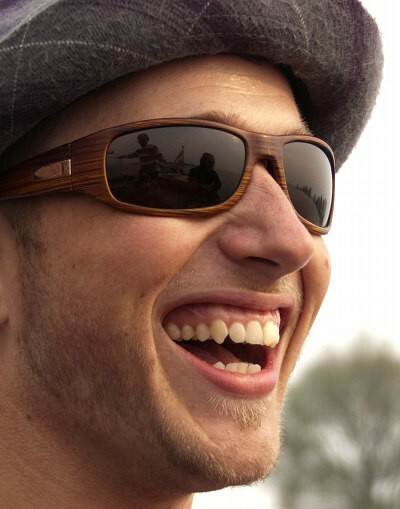 He can’t contain his large smile as he listens to an audio version of OralAnswers.com. This blond lifeguard rocks a pink powerchain. 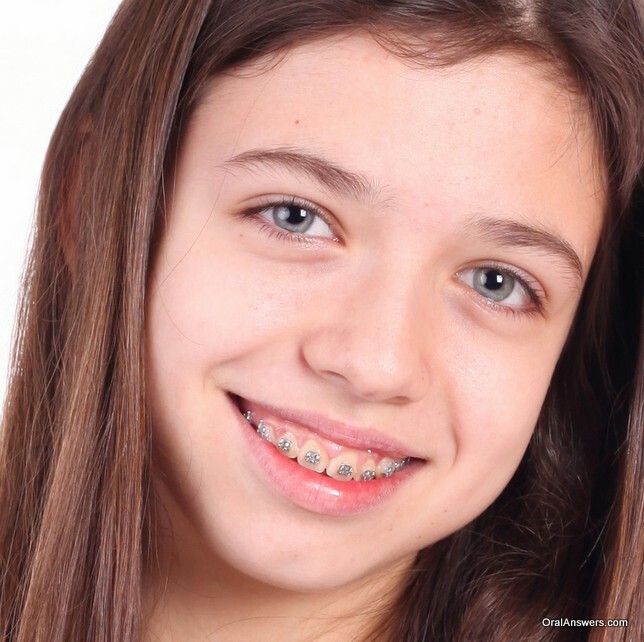 This young woman chose white elastics to help hide the silver color of her braces. 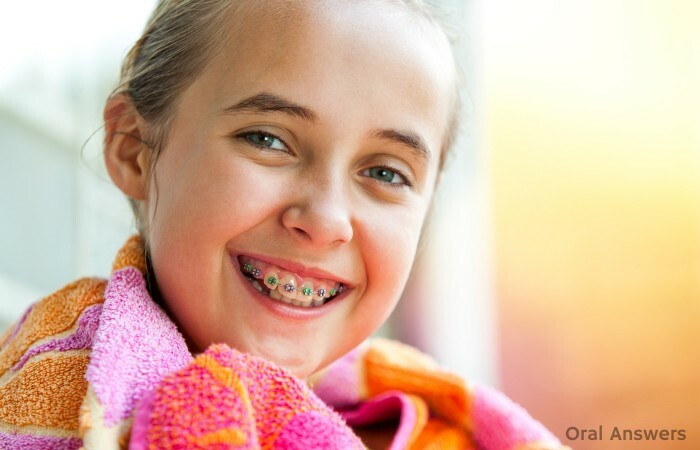 Although white bands can be a good choice for some, many teenagers with braces find that they make their teeth look more yellow. 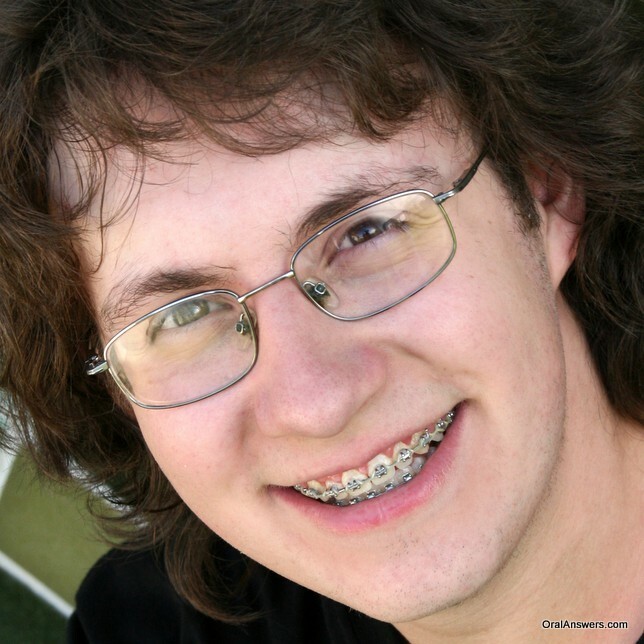 This young man confidently smiles, unafraid to show the world that he has braces. This young woman has ceramic brackets, which don’t stand out quite as much as the silver brackets. 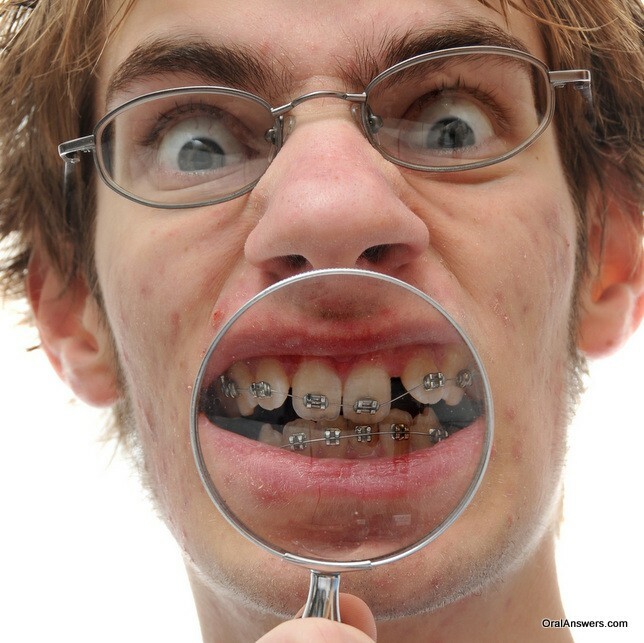 This young man isn’t trying to hide the fact that he wears braces. His strategy seems to have garnered the interest of at least one woman. This fashionable young woman probably enjoys the bling her braces add to her outfits…and it looks like she can’t stop looking at the attractive fellow in photo #25! 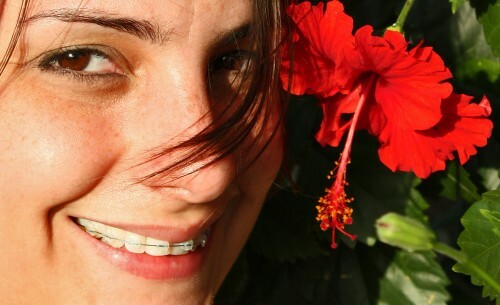 This young woman confidently displays her braces for the world to see. 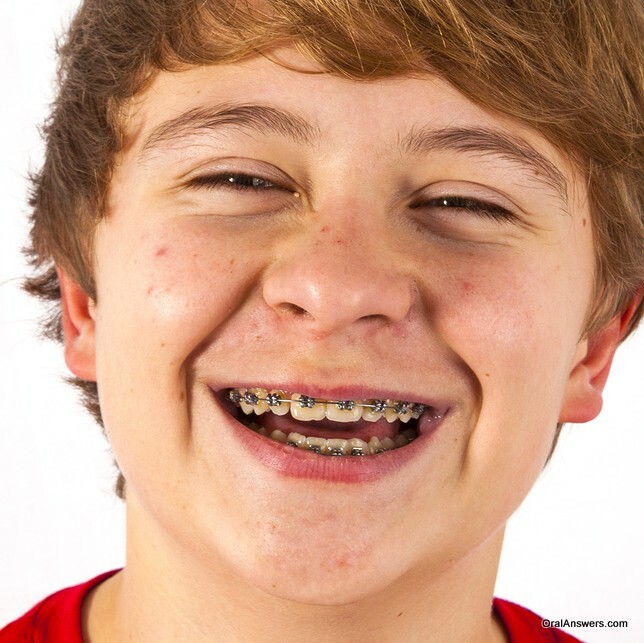 This young man’s confidence goes a long way at convincing the viewer that he is comfortable with his braces. This young lady’s mouth just needs some Christmas lights to be all ready for the holidays. This young brunette displays her top-notch oral hygiene skills by using an interdental cleaner to help keep her pearly whites healthy. This young man is having a fabulous hair day as he shows off his ceramic braces which are designed to hide the fact that the person has braces. This confident young woman shows off her braces. This young woman probably wouldn’t be smiling so big if she knew she lost her braces wire. 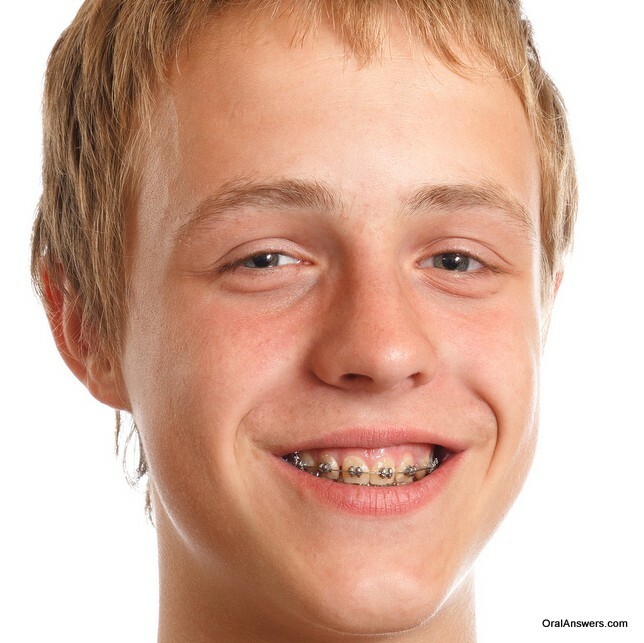 This young man confidently smiles, letting the world know that he’s proud of his braces. 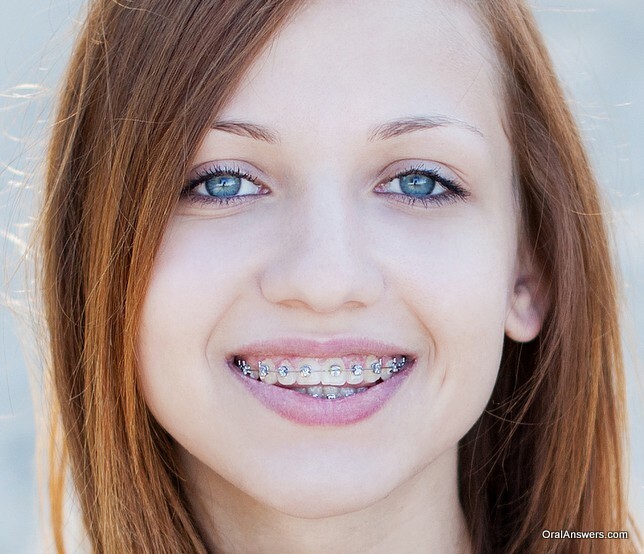 This red-haired, blue-eyed young woman sports her Damon braces with confidence. 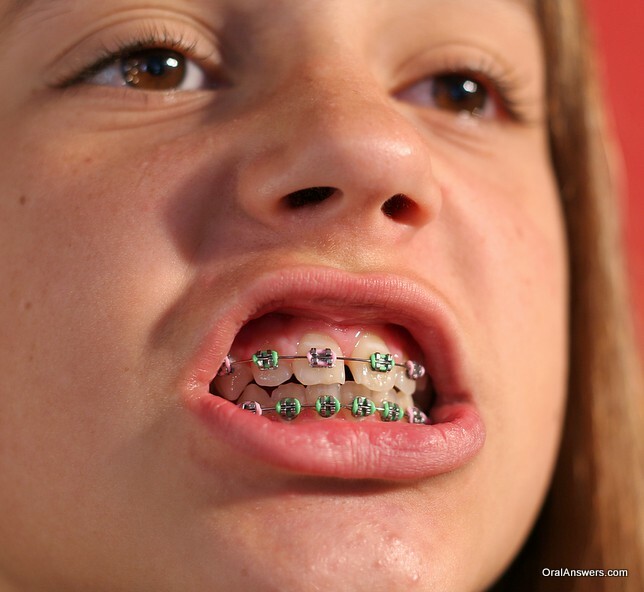 This brown-haired young woman shows off her braces with purple-colored elastics. This young man proudly sports some light-green colored bands and a thin mustache. 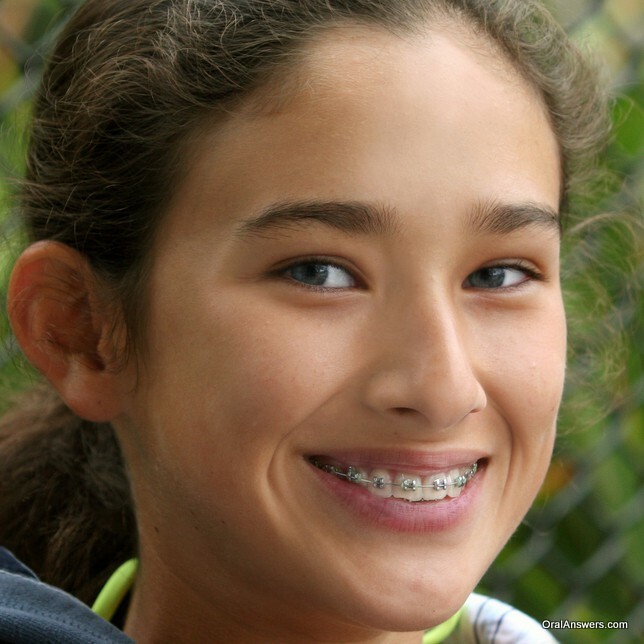 This dark-brown-haired young woman proudly shows off her braces. This young woman shows us through her big smile that it is possible to maintain beautiful teeth even while wearing braces. This young woman is trying to make her teeth appear whiter by going with an off-white elastic band. This teenage young lady shows that you can still look good during the initial phase of braces while your teeth are still crooked. 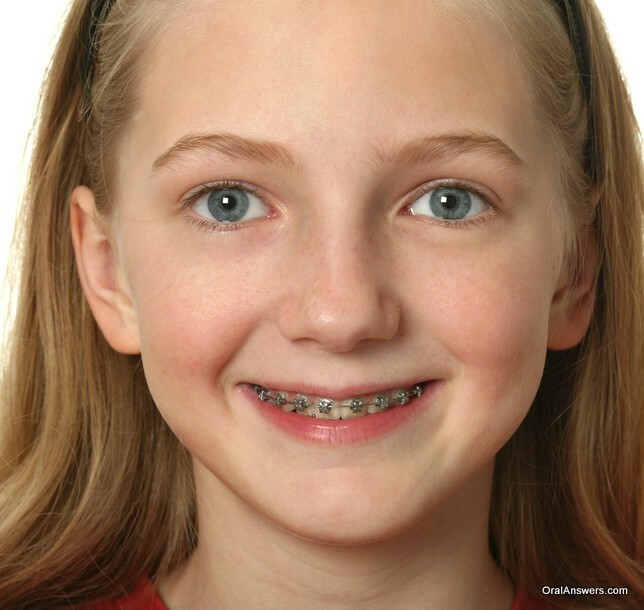 This young lady shows off a sweet, innocent smile with her braces. 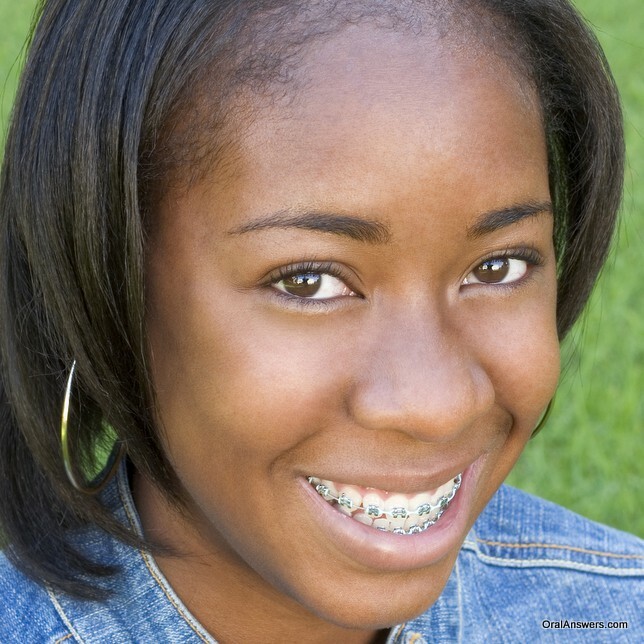 This young woman shows off her Damon braces with a confident smile. This teenage girl recently had her braces put on. If we give her a few months, she’ll soon move from a half-smile to a full, confident smile. This young man is trying to distract from his braces with some facial hair. This young woman cleverly distracts the viewer from her braces to her eyes. 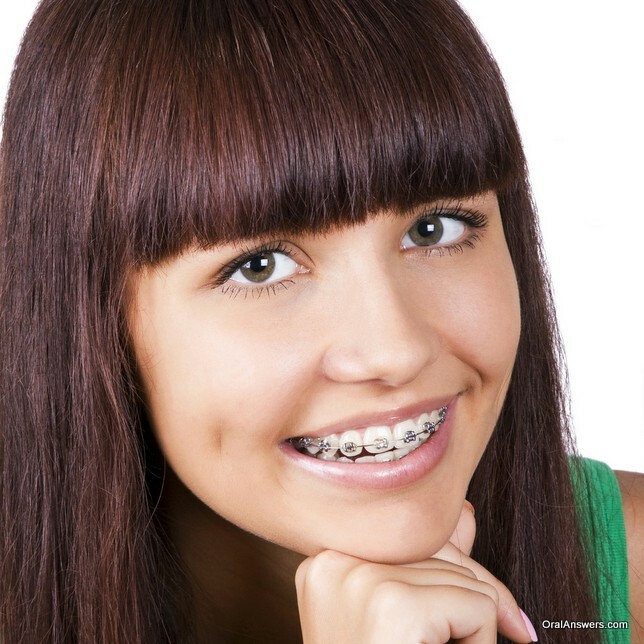 One way to take the emphasis off of your braces is to guide the attention away from your mouth to other features. She does this with her eye shadow and her large earrings. 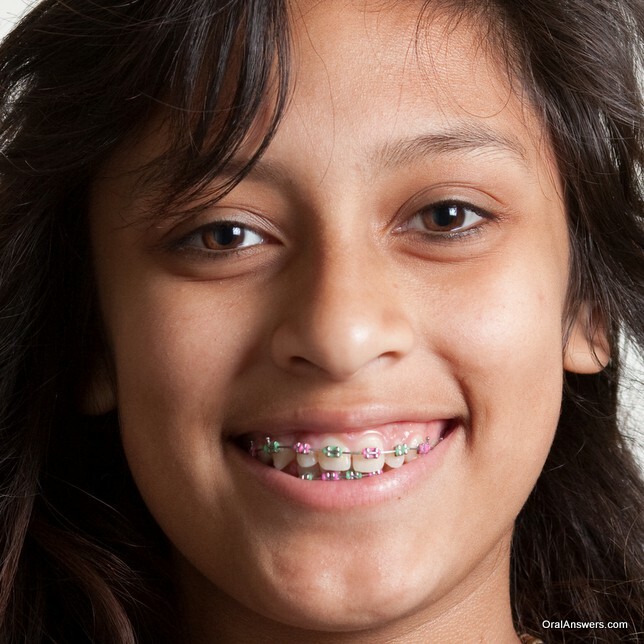 This young woman’s braces are barely noticeable. 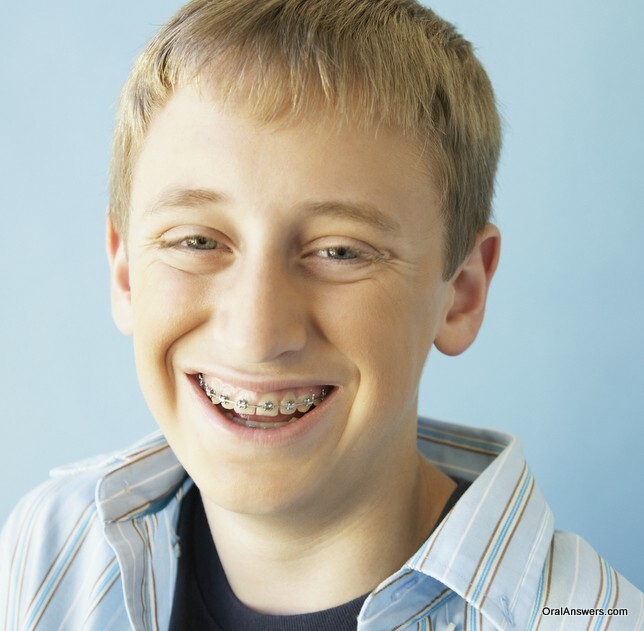 You can ask your orthodontist about more aesthetic options such as ceramic braces and lighter-colored wires. 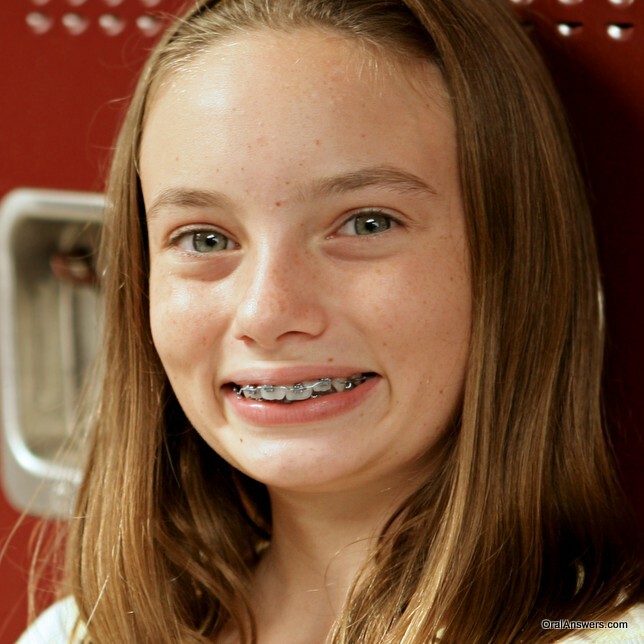 This teenage girl just got her braces, and is still getting used to smiling with them. 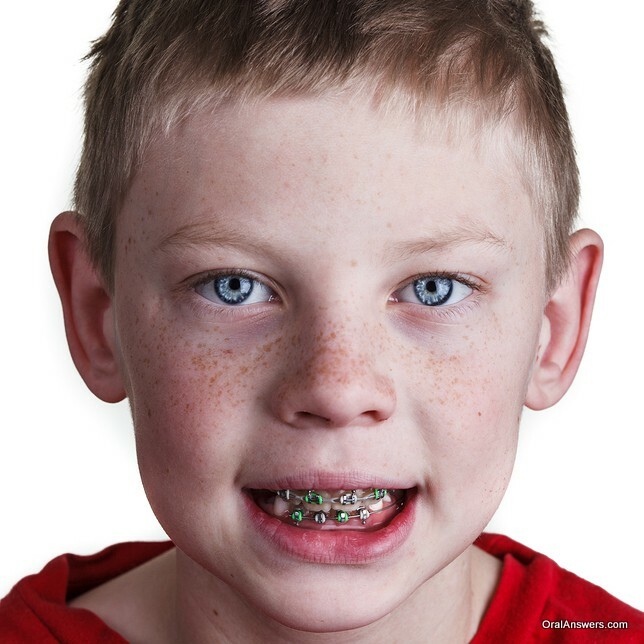 This young man proudly shows off his gray and green colored elastic bands for his braces. 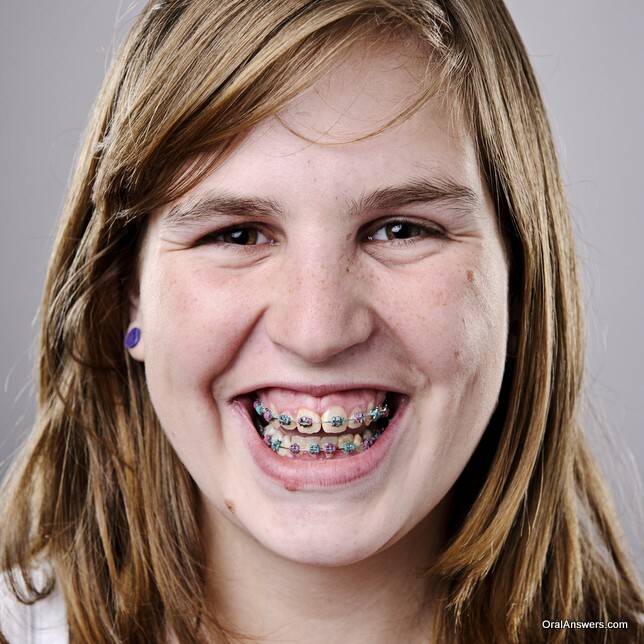 This young woman displays a confident smile with her braces. These teenage girls are having fun swimming. It’s important to remember that braces don’t define who you are,!l Life continues to go on and you can participate in the same activities you did before you had braces. You can see the same teenager in the above and below photos. Notice how the different smile totally changes the appearance of her whole face. After you get braces, practice smiling and speaking in front of a mirror, as the braces will make your mouth feel different. This young man can confidently laugh at a joke. Don’t be afraid to let people know you have braces, because they will probably notice even if you try to hide it. 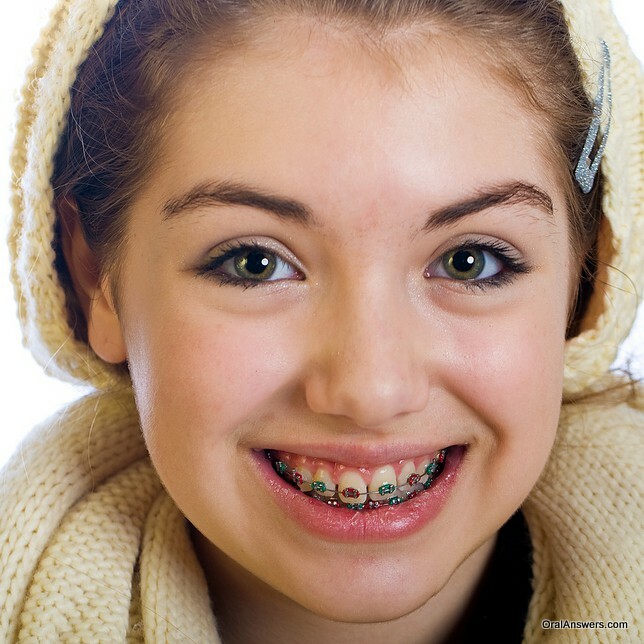 This young woman has consulted with her orthodontist about aesthetic optiosn to help disguise braces. 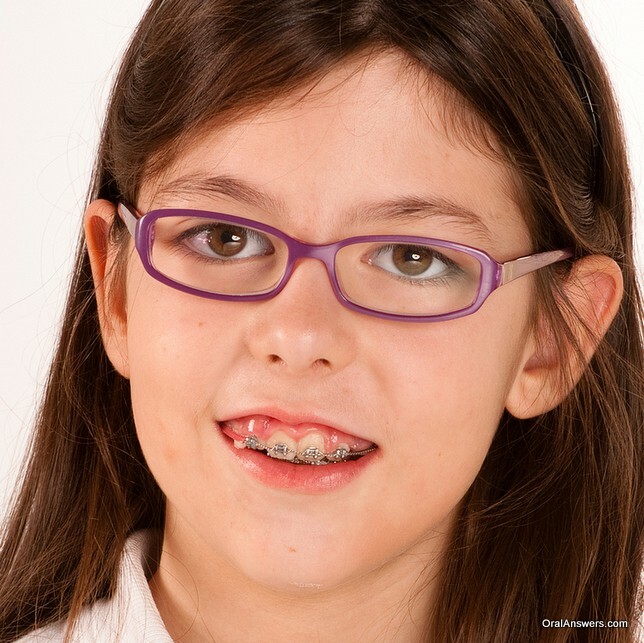 This teenage girl has taken some of the focus off of her braces by wearing glasses that stand out with purple frames. This young lady is still working on getting her smile right with braces, as she’s scrunching up her nose a little bit, causing more of her upper gums to show. 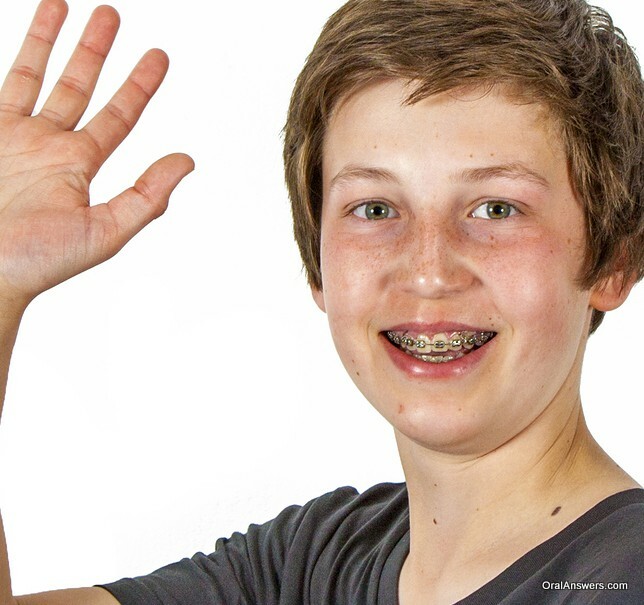 This teenage boy proudly waves, desperate to show off his braces to anyone who will look. 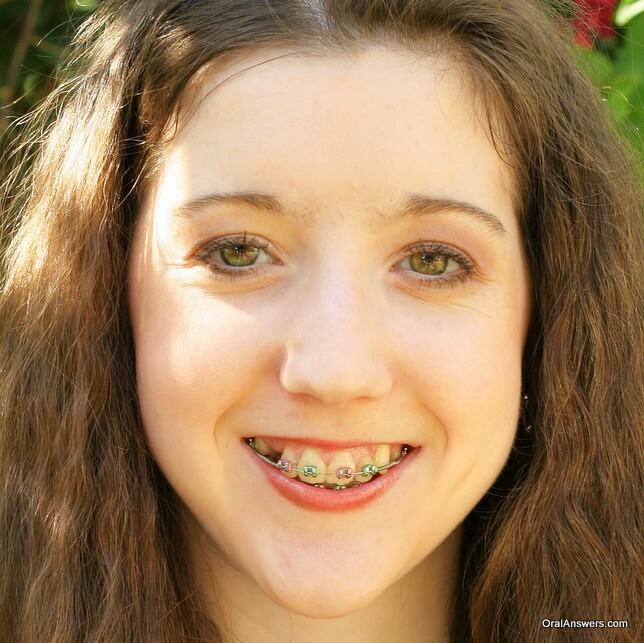 This teenage girl takes some of the focus off of her braces with some green eye shadow. 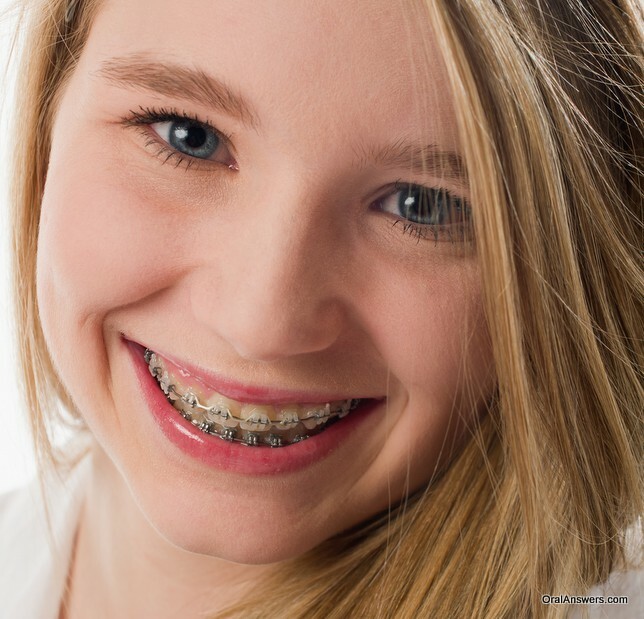 This young blond-haired teenager proudly displays her braces with confidence. 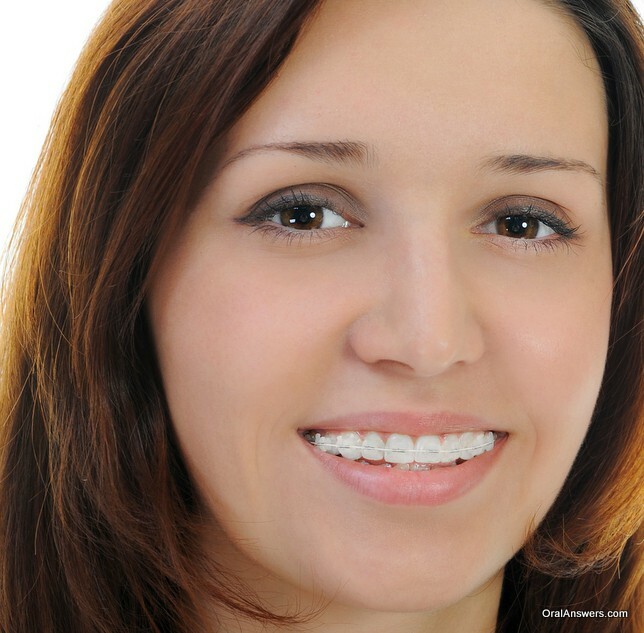 This young woman disguises her braces with a white powerchain. 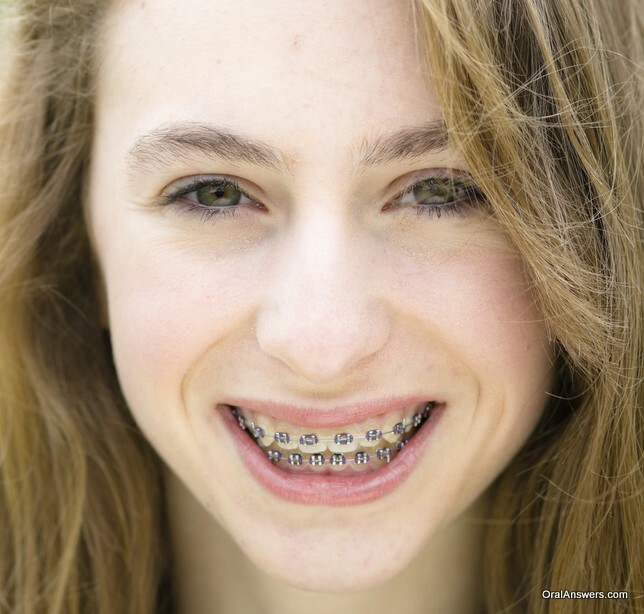 Hopefully this sampling of photos of teenagers with braces has helped you see how you might look with braces. One of the most important takeaways is to simply be confident with braces. They are temporary – they won’t define who you are. You might as well be confident while you have them. 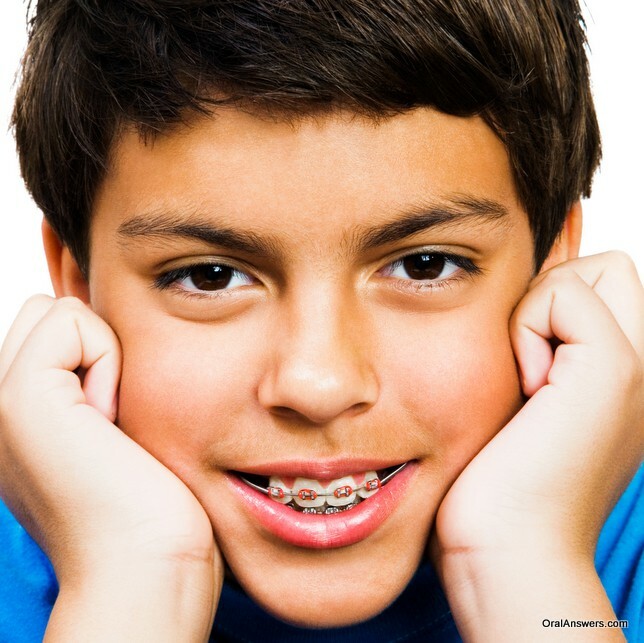 If you have any questions about braces, feel free to leave them in the comments section below. Thanks for reading! Did you know that while you are reading this, there are many different forces acting on your teeth? I’m guessing that right now your tongue is probably slightly resting on the the back of your lower front teeth and the inside of your lips are resting against your front teeth. If you took a magic school bus ride into the average person”s mouth, you’d probably find the same thing. Did you know that both of these forces along with other forces can affect how your smile looks? In this article, I will go over some of the forces that act on your teeth and how you can make sure that they don’t negatively affect your smile. As I mentioned above, your lips push your teeth into your mouth while your tongue pushes your teeth out. They eventually find an equilibrium known as the neutral position. Normally these forces are good. 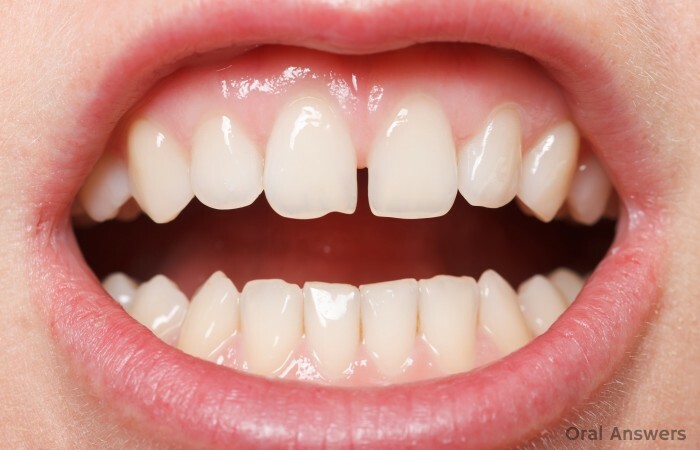 For example, these forces help keep your teeth arranged in a symmetrical arch. These forces can also help push permanent lower front teeth out away from the tongue when the permanent teeth come in behind the baby teeth. However, if the forces in your own mouth get out of hand, they can push your teeth into abnormal positions. Did you know that the average human swallows more than 2,000 times every day! If you go ahead and swallow right now, you’ll notice that your tongue pushes against your upper front teeth. 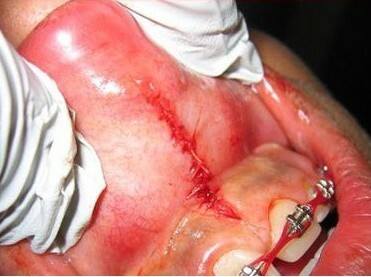 As long as you don’t push excessively on your front teeth, usually everything is fine. Some people have habits that cause them to hold their tongue between their teeth all the time or to push their tongue out excessively when they swallow. The forces that your lips apply to your teeth can become a problem if you develop certain habits. One such habit is tucking your lower lip behind your upper teeth. This is especially common in younger children and people who bite your-pharmacies.com their lips when they get nervous. The labial frenum has been accused of moving the front two teeth apart after they are perfectly aligned with braces. 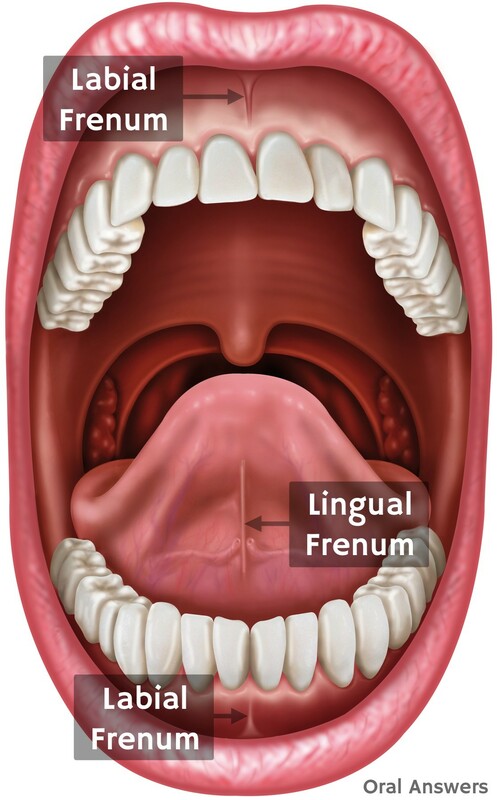 For this reason, some people choose to cut away the frenum by getting a frenectomy. Other teeth (or the lack thereof) can move your teeth. Normally when you bite together, your teeth touch and rest in a certain position. This position is known as centric occlusion. Normally, the top teeth oppose the bottom teeth and keep them in check. However, when you lose a tooth, things get interesting! When you lose a tooth, the teeth drift to fill the space. 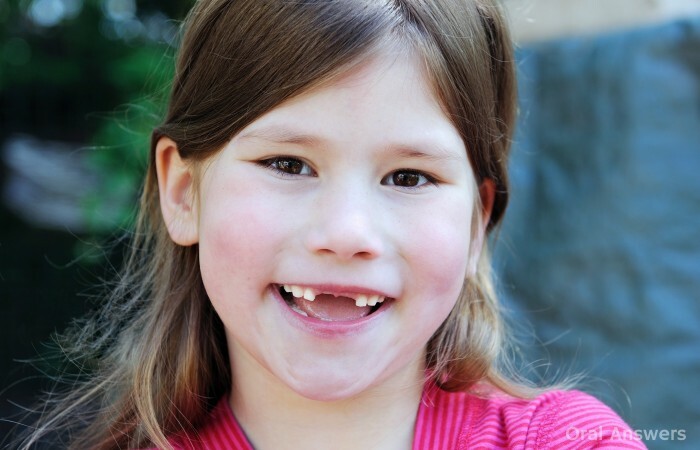 The teeth on either side of the lost tooth move, as will the tooth that opposes it. 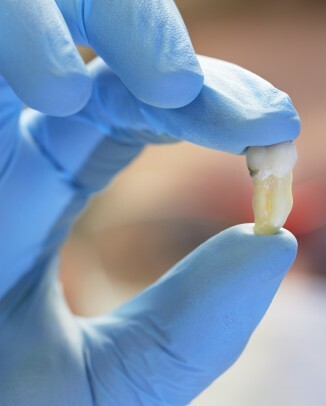 For example, if you lost a lower tooth, the tooth on the upper jaw that normally hits it would start to grow down slightly to fill in the space and the adjacent teeth to the lost tooth would start to lean in towards the empty gap. Certain habits involving tooth-to-tooth contact, such as clenching or grinding your teeth could also cause movement of your teeth. 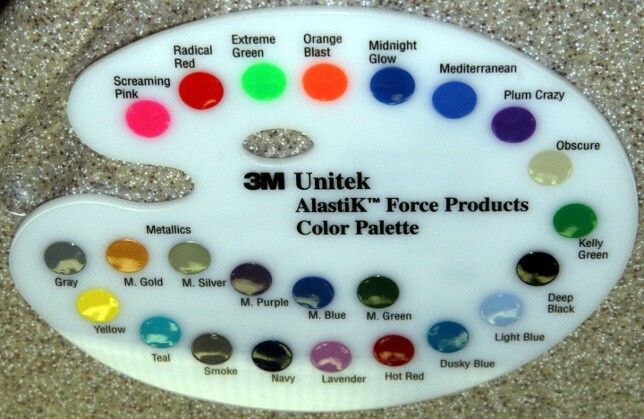 Another force that can move your teeth is described in Ten Cate’s Oral Histology textbook. It talks about the back teeth pushing forward ever so slightly against each other, which causes a gradual forward movement of your teeth as you get older. As you can see, there are many different forces that are constantly acting on your teeth that could cause them to move. In addition to these internal forces from your own body, teeth can also move due to external forces such as braces, pipe smoking, or musical instruments. I will discuss these forces in more detail in a future article. Do you have any questions, comments, or concerns about tooth movement caused by these forces? I’d love to hear what you have to say in the comments section below. Thanks for reading! 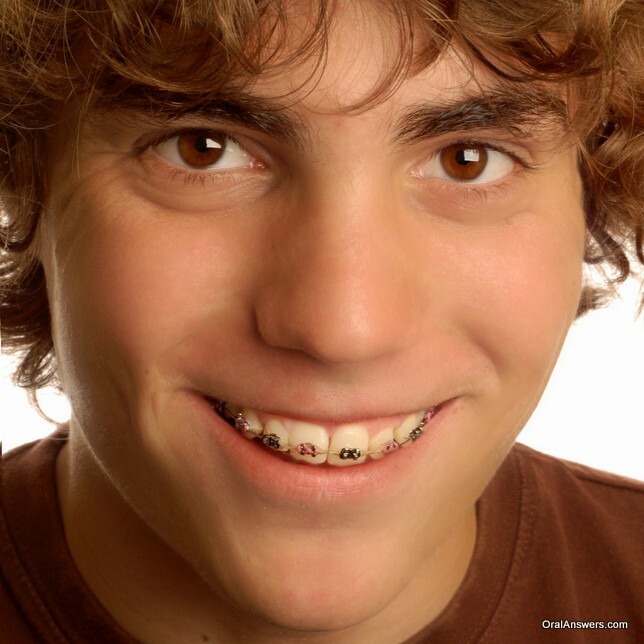 Can a Dentist Who’s Not An Orthodontist Offer Braces? I frequently get emails from people asking me if a general dentist is allowed to provide orthodontic treatment to their patients, or if this can only be done by orthodontists. I have heard stories of general dentists competing with orthodontists in various cities. One of my friends in dental school told me about a certain town where the general dentist was doing a better job than the orthodontist, and ended up doing more orthodontics than the orthodontist. Orthodontics, like many things in dentistry, is dependent on how well you can visualize the final treatment and how good you are with your hands. Orthodontists do get an extra two to three years of specialized training in orthodontics and braces beyond dental school, but obviously every orthodontist has a different level of skill. In order to measure up, a general dentist would need to take a lot of continuing education classes and gain a significant amount of experience. My family dentist says he can straighten my teeth. Last fall, the Academy of General Dentistry (AGD) reached out to the AAO to explain that these two statements are often true, and not myths. The second “myth” says that orthodontists charge more than general dentists for orthodontic treatment. 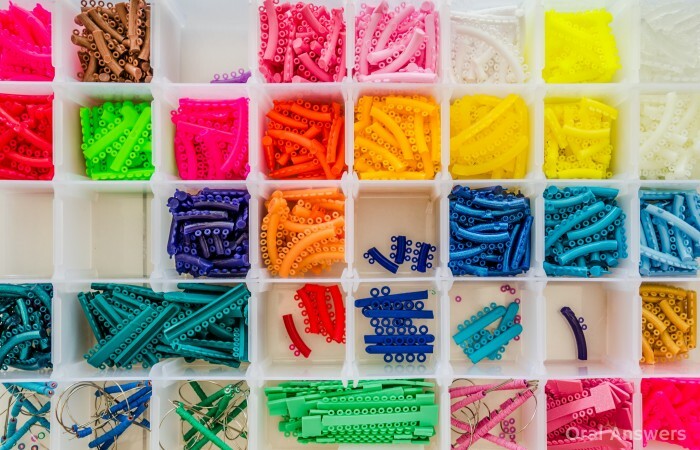 This is a myth because the cost of orthodontics is mainly based on the complexity of treatment, not whether the person providing the treatment is an orthodontist or dentist. Unfortunately, even after receiving the letter from the Academy of General Dentistry, the AAO has still not changed their misleading website. In order to illustrate that the two statements above are indeed myths, I’d like to share a story about Dr. June Lee, a general dentist that decided to incorporate orthodontic treatment into her family dental practice. Since then, Dr. Lee has incorporated orthodontics into her general practice. She saw it as an opportunity not only to expand upon her skills, but to fill a need within her patient community. I really liked Dr. June Lee’s story as it shows initiative. She didn’t like what the orthodontist was doing to her patients. She decided she could do a better job — and she went ahead and did it. Can All General Dentists Provide Orthodontic Treatment? 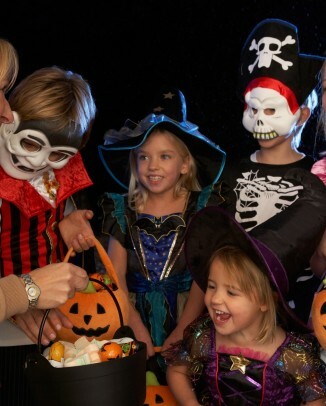 Not every general dentist offers orthodontics. 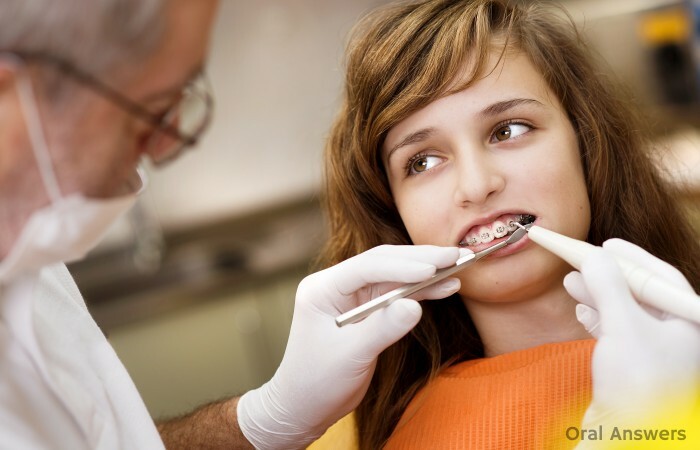 In fact, most general dentists simply refer all of their orthodontics cases to an orthodontist. It all comes down to what a general dentist enjoys doing. 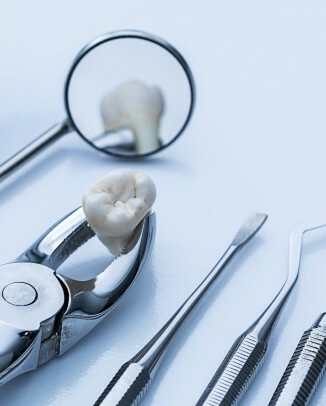 Some general dentists do lots of root canals, others do lots of braces, and others refer all of their patients that require root canals or braces treatment. I don’t by any means want to imply that orthodontists aren’t necessary. 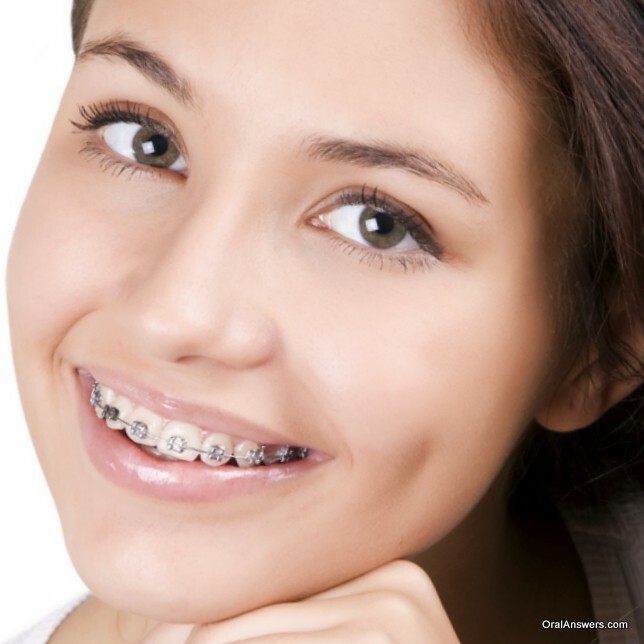 Orthodontists provide wonderful service to the general public in most cases. 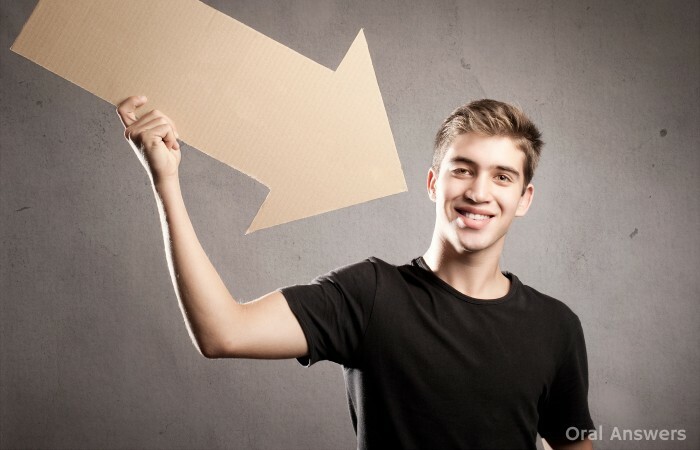 I simply want to point out that general dentists can provide excellent orthodontic care to their patients if they participate in the right continuing education and have gained some additional experience and expertise in this area. 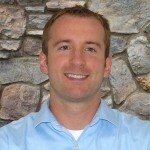 Do you have any questions, comments, or concerns about general dentists and orthodontics? I’d love to hear what you have to say in the comments section below. Thanks for reading! For some reason I just noticed that one of brackets has two elastic bands on it. One one One side of the bracket and the other on the other side of the bracket. Not one just going around the whole bracket like the rest. Is this normal? Or just a mistake? Here’s a picture showing what I think Emily was getting at: To answer Emily’s question — it probably wasn’t a mistake. 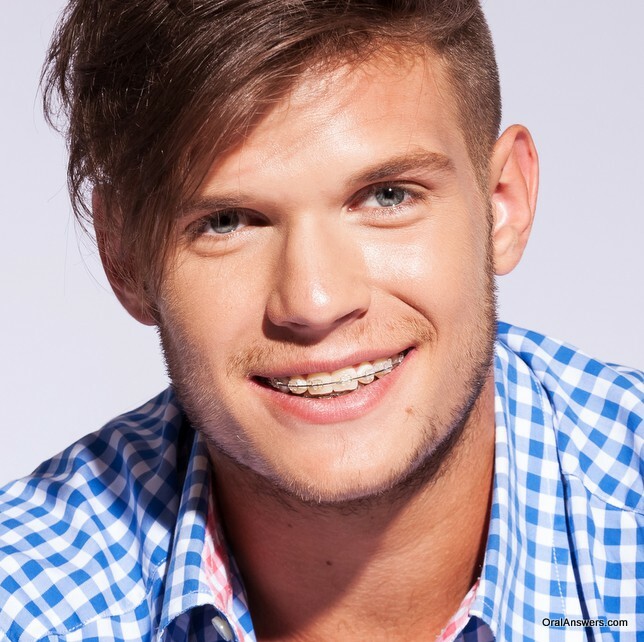 If you look in the photo above, you can see (aside from the great choice of colored braces) that there are some spaces present the upper first and second teeth from the middle. 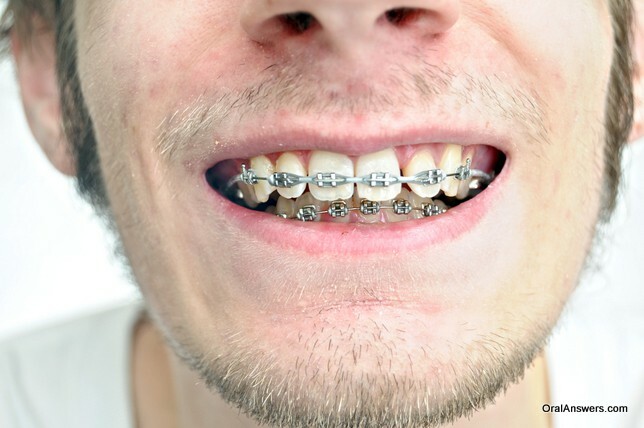 In my opinion, the orthodontist is using the extra band to make sure that a big space doesn’t open up between the front two teeth. 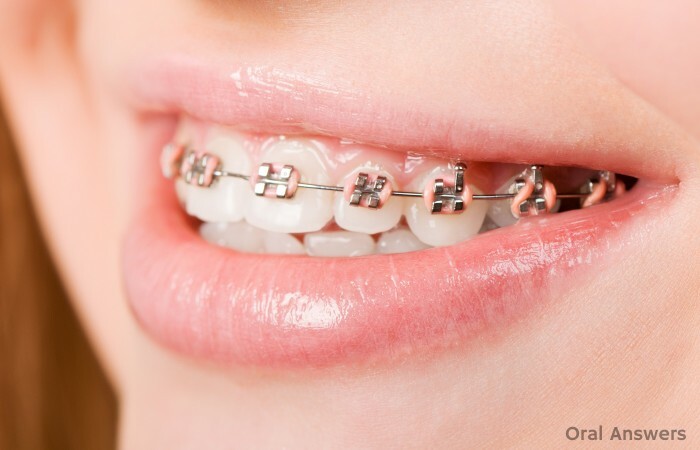 Another way that orthodontists can keep teeth together while they move them is through the use of a power chain. 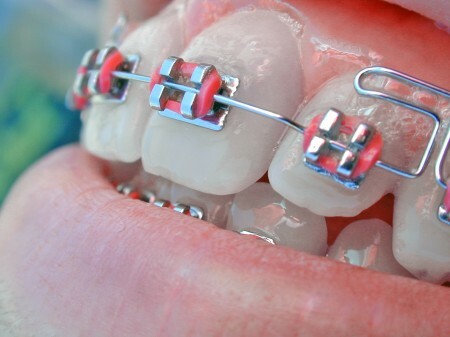 To learn more about power chains and how they hold your teeth together, read the article, Power Chains: Why Some Colored Braces are Connected. I hope that helps everyone out there who may have been wondering the same thing. 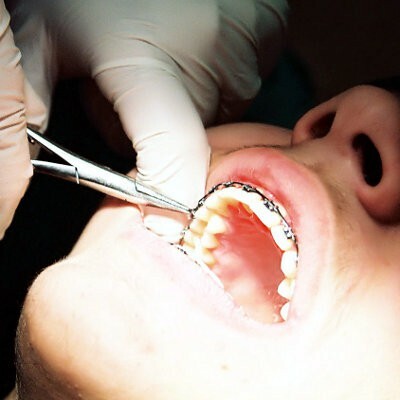 If you have any other questions about braces, go ahead and leave them in the comments section and I’ll do my best to answer them. Thanks for reading!